Map Turtle Care sheet and information about baby map turtle care including Map turtle habitat, Map turtle feeding and more. Mississippi map turtles require a turtle tank as their enclosure. This is because they will need fully submerged sections without risk of warping or leaking. The Mississippi map turtle can grow to 10-12” long and needs a proportional amount of space to live happily. For this reason we suggest a tank with at least 15″ width. 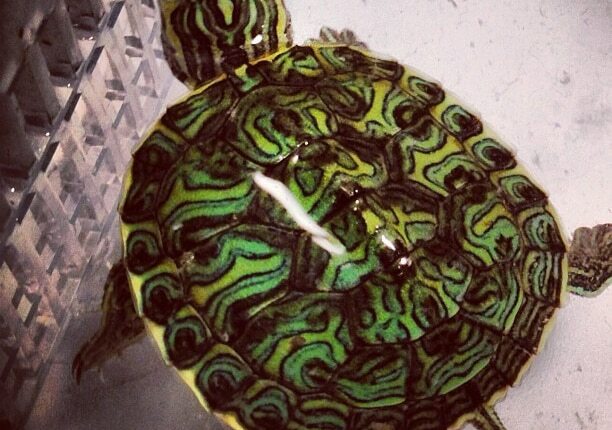 As juveniles the Mississippi map turtle can be kept in a 12″enclosure but this will have to be upgraded as they grow. There are no detrimental effects for having them in the enclosure for life straight away so we usually suggest you start with the full set up. During the day the peninsular turtle will periodically move on to the basking area. This Allows the turtle to dry off, warm up, absorb UVB and rest. A good basking spot should be around 80oF and provide sufficient UV. All Turtles require additional UVB lighting.Mississippi map turtles require UVB light in order to synthesise vitamin D. Without vitamin D (in particular D3) mississippi map turtles are not able to metabolise calcium properly causing problems with bone growth. A spot light and UV tube can be used over the basking area of the turtle. Either a 60w or 100w basking bulb should be sufficient depending on temperatures achieved. A 12% intense UV tube (either T5 or T8) can be used to provide the intense UV. Alternatively a single mercury vapor bulb (MVB) can be used to provide both heat and UV. This bulb should be placed 30cm or closer and will need a porcelain or ceramic lamp holder. The mississippi map turtle will eat a range of aquatic foods, meat products and live foods. Map turtles can also be fed dried foods when the fresh or live options are not available. The dried food should be created with shrimp or meat protein rather than vegetation. We’ve found that crickets are the most readily accepted, but you can also use dubia cockroaches or locusts, shrimp, salmon. The most important decoration in a map turtle enclosure is the basking area. It should be large enough to fit the turtle with some room to turn. The basking area should always be in line with the water level to ensure that your turtle can get out easily, there are floating docks available that will reposition to match the water level. A good basking area will also include a ramp for the turtle to make it easier to climb. Artificial plants are a great way to provide cover under water and add color to the enclosure. Those with weighted bottoms can be fully submerged whilst light plastic decorations can be left to float on top. Giving the turtles partial cover and a mixture of weighted and floating decorations provide great enrichment and help the turtle feel secure. Large pebbles, coated gravel or riverbed sand can be used to line the bottom of the enclosure. It is advisable to clean any substrate before placing it into the enclosure. The substrate should be left to settle before the equipment is turned back on and the turtles are put in. At TortoiseTown, we are proud to have the largest selection map turtles for sale including some fantastic aquatic turtles for sale. In addition we also have the largest selection of box turtles for sale online anywhere. We have everything from the common box turtle for sale, including the eastern box turtle, baby eastern box turtles for sale, adult eastern box turtle for sale, 3 toed box turtle, ornate box turtles including baby ornate box turtle for sale. Baby ornate box turtles are very similar to desert box turtles. We also have florida box turtles, gulf coast box turtles, chinese box turtle for sale and more. While the baby chinese box turtle is probably the most expensive, it is also the most rare. All of our baby box turtles for sale are 100% captive bred and are raised inside our baby turtle adoption facility. With a biologist on site, you can expect a health new pet box turtle for sale from tortoise town, shipped year round! Remember when searching for any tortoises for sale, including a new baby tortoise for sale, tortoise town is your source for the best tortoise for sale , baby tortoises for sale , baby turtles for sale, and adult turtles for sale of any turtle store anywhere including a huge aquatic turtles for sale section. If you are interested in tortoise care, please visit our care section.